How to Get Your Voice Mail Messages Returned! Did you know there are four compelling ways to motivate prospects to return your calls? And do you know how to avoid the six most deadly voice mail mistakes? As you study every word of this e-book, you will be surprised at how easy it is to start leaving voice mail messages that motivate prospects to return your calls. And you will . . . Learn the five steps in an effective voice mail message. Get step-by-step worksheets you can use to create your own unique voice mail message. 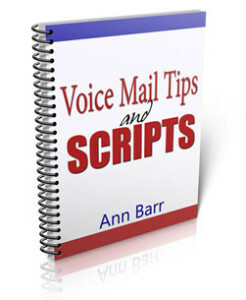 Get 12 proven successful scripts for different voice mail message situations. “The Best ROI in 18 Years! ID Superstore, PICS SmartCard Inc. The further you read into this book, the more you will realize why some sales reps DO get their calls returned. Once your credit card or PayPal payment has been authorized, you will be taken to a secret URL where you can download the e-book in just minutes. Most people would expect to pay a minimum of . . . say . . . $49, $39, $29, or more for this valuable information.